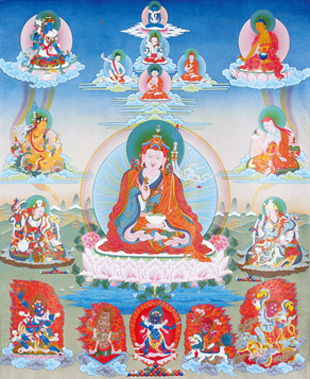 Sets of thangkas of the Eight Manifestations include a central image of Guru Pema Jungné. ↑ Dalai Lama, Dzogchen, page 230. Yeshe Tsogyal, Padmasambhava Comes to Tibet: 25 Disciples - Vajra Guru Mantra - Prayers, Dharma Publishing, 2008. This page was last edited on 27 March 2017, at 08:48.